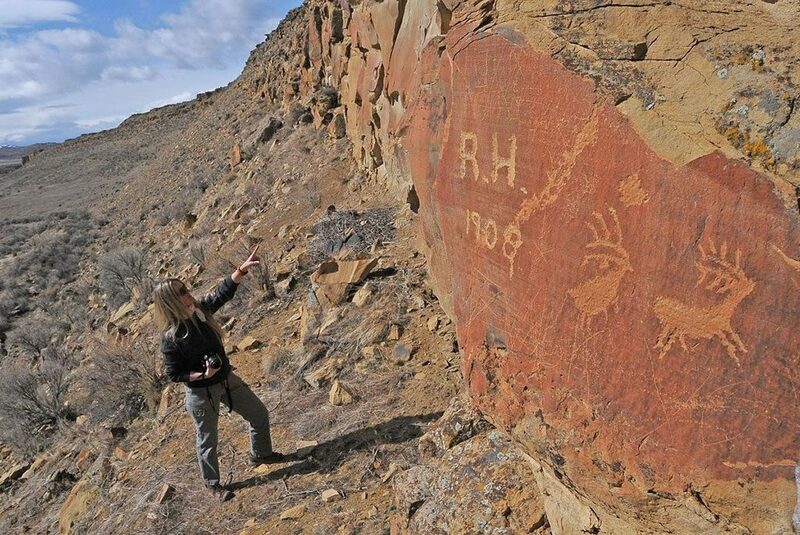 Bonnie Lawrence-Smith at Legend Rock Petroglyph Site. Join us for our November Draper Natural History Museum Lunchtime Expedition lecture. Bonnie Lawrence-Smith, Curatorial Assistant for our own Draper Museum, presents Cry to Heaven: Golden Eagles and Thunderbirds in the Bighorn Basin. The talks in this series are free, and take place in the Buffalo Bill Center of the West’s Coe Auditorium. Throughout the history of man, he has tried to organize his world and its natural phenomena into nice little packages of stories and myths to explain the extraordinary in ways comprehensible at the time. What we know today as science was alien to those who came before. Our early fathers would cry to Heaven, beseeching what powers that be, to bless, curse, or create. And so, it is through time that we create stories to explain the world around us barring any other explanation. Gods, demons, and bogeymen will punish you if you don’t behave according to societal standards. Pulling you screaming into the murky depths of whatever lies below; the abyss. Lawrence-Smith proposes that early peoples living in the Bighorn Basin of the Great Plains were no different than other populations on the planet; weaving stories as explanations for the natural world. Here in the Plains Basin of North America, we find some of the most exceptional rock art in the Americas. Consistently depicted among the stones are raptors, large birds of prey. Some are highly stylized while others are easily identifiable. And others represent the transformation of man into beast and bird. Through this project, we examine several sites in the Bighorn Basin, both public lands (BLM, Forest Service, and State of Wyoming) as well as some privately-owned lands. Lawrence-Smith proposes that there is a direct correlation and connection between ancient eagle (Aquila crysataetos) nests, Native American eagle traps, and thunderbird representations at rock art sites in the Bighorn Basin and the early Native American narrative. Bonnie Lawrence-Smith is the Curatorial Assistant for the Draper Natural History Museum at the Buffalo Bill Center of the West. She began working for the Center in May of 2010 but moved to the Draper in 2011 to serve as the program coordinator. She is an active member of the Wyoming Association of Professional Archaeologists, president of the Absaroka Chapter of the Wyoming Archaeology Society, and an organizing member of the Cody Culture Club and P.E.A.K.S. She also on the board of the Park County Historic Preservation Commission and the Montana Archaeologists education board. She has worked with HistoriCorp, on several projects in both Colorado and Wyoming. A Wyoming native, Lawrence-Smith received her Associate of Arts degree in Anthropology from Santa Monica College in 2007, and a Bachelor of Arts degree in Anthropology and Art History from the University of California, Los Angeles (UCLA) in 2009. While at UCLA, she worked with Dr. Thomas Wake in the Zooarchaeology lab investigating the ancient diet of people living off the Panamanian coast, and with Dr. David A. Scott in the Cotsen School of Archaeology conservation lab studying ancient metallurgy.